Service animals are a reliable resource for millions of Americans with disabilities; therefore, it is worth understanding their importance as it relates to the Americans with Disabilities Act (ADA). The ADA not only sets the definition of a service animal, it also protects people with service animals from being discriminated against. A service animal is an animal that is trained to complete duties that assist people with disabilities including physical, mental, sensory, intellectual and psychiatric. Under the ADA, service animals are allowed to accompany people with disabilities in public spaces as long as the service animal is under control and does not compromise the health of the environment (such as keeping an operating room sterile). Guiding a person through their environment How are service animals trained? Service animals are mostly common dogs. Services dogs may be trained through a specialty organization, by a dog trainer, or by the person with a disability. Training a service dog is a lengthy, involved process, so getting guidance from people who have experience in this area is important. Certain breeds of dog make better service animals than others because of their overall temperament. 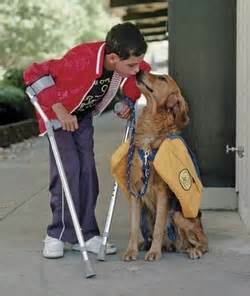 For example, a common breed of service dog is a Labrador retriever because they tend to be easygoing and intelligent. Service dog training prepares canines to function in real-world scenarios that will assist their handler. Service animals are trained in three major areas: obedience with proofing, manners and task training. This kind of training may take anywhere from 18 to 24 months. Training a service animal begins with manners and basic obedience. A service animal should be prepared to take commands from their human handler. Service animals should ignore everyone else around them other than their owner. This means they must ignore people when they call them to offer food or even play with them. The best way to know whether a service animal has successfully been trained is whether the animal passes a public access test. There are various bodies that offer public access tests to animals. Owners of service animals will typically have documentation of their service animal passing this test. Service animals are very well trained and, in most instances, are very cute! It can be very difficult to not engage these animals when in public. However, if you do see someone with a service animal in public, the most important thing to do is ignore the service animal and address all comments or questions to the person. Do not under any circumstance reach to touch or pet the dog, talk to the dog, or call the dog’s name. Petting or talking to the service animal is highly disruptive to the service animal’s duties. It not only distracts the dog, but also teaches the dog to seek attention from other people outside of the owner. If you do you have questions about the service animal, ask the owner. Daniel is the founder of Pool University, a website dedicated to provide quality information for existing and prospective pool and spa owners. You can find articles covering pool chemistry, pool equipment buying guides, pool activities, pool safety, and many more. As a swim enthusiast, Daniel also likes to share his passion for swimming by writing motivational articles to promote activities (mostly swimming related) that are good for both the body and mind. The ADA has had many positive effects in shaping disability culture in regards to access and accommodation. This has been a very beneficial one. Continued success with service animals as they provide a healthy active life for people with disabilities that need their assistance.